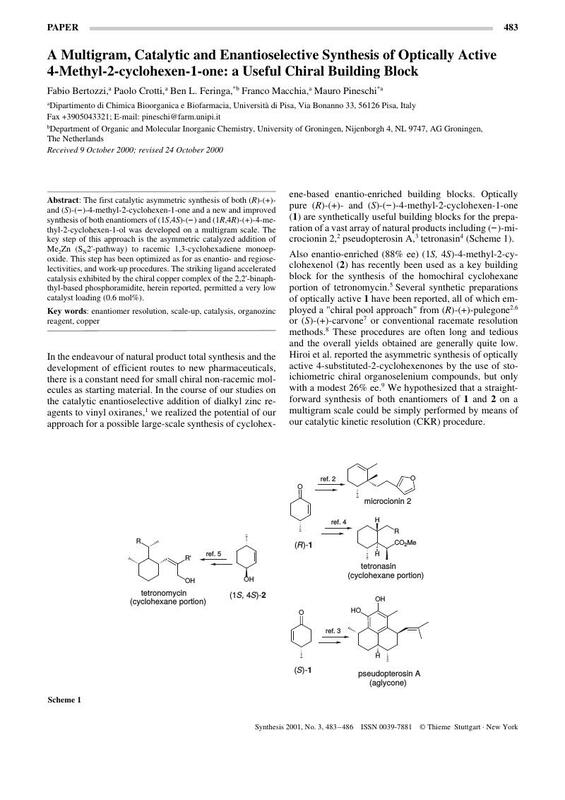 The first catalytic asymmetric synthesis of both (R)-(+)- and (S)-(-)-4-methyl-2-cyclohexen-1-one and a new and improved synthesis of both enantiomers of (1S,4S)-(-) and (1R,4R)-(+)-4-methyl-2-cyclohexen-1-ol was developed on a multigram scale. The key step of this approach is the asymmetric catalyzed addition of Me2Zn (SN2′-pathway) to racemic 1,3-cyclohexadiene monoepoxide. This step has been optimized as for as enantio- and regioselectivities, and work-up procedures. The striking ligand accelerated catalysis exhibited by the chiral copper complex of the 2,2′-binaphthyl-based phosphoramidite, herein reported, permitted a very low catalyst loading (0.6 mol%).